Caladh Reidh (meaning ‘Calm Harbour’) aptly describes the setting of this lovely cottage situated in the picture-postcard village of Plockton, with palm trees and warmed by the Gulf Stream Plockton is an idyllic village in the western highlands. Caladh Reidh can be seen in the middle of the group of houses pictured here with Obanduine Bay in the foreground. It is a traditional whitewashed two storey stone cottage with gardens to the front and the rear. It is situated on Harbour Street, in the village of Plockton and looks down to the waters of Obanduine Bay. The cottage is bright and spacious with a lovely homely feel and offers very comfortable accommodation in three first floor bedrooms, and ample living space downstairs. The cottage is exceptionally well equipped throughout with all you could need for a family holiday. The lounge has a comfortable suite, open fire, smart TV, Hifi, books and games. The kitchen has washing machine dishwasher cooker microwave, fridge freezer and dining area with TV. There is a separate dining room with dining table and chairs, fireside chairs and TV. The main bathroom is downstairs and there is a second toilet upstairs. 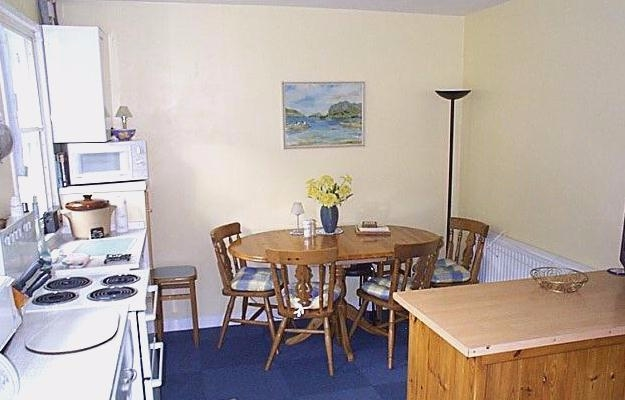 There is central heating throughout and complimentary wi-fi. At the back of the cottage there is a secluded garden with an array of shrubs and a small path meanders down the centre with lawns either side. Air warmed by the Gulf Stream makes this village a unique growing area, with palm trees and many unusual plants flourishing. Opposite the cottage is what can best be described as a secret garden. With mature shrubs, lawns and hidden seating area, it is a lovely spot to sit, sunbathe, read or enjoy a quiet glass or two. There is a wide range of sporting activities available close by. Canoeing and sailing are popular pastimes in the village and there are a number of excellent golf courses in the area which are open to visitors. Fishing, riding, climbing, hill-walking, mountain biking and bowling are all also enjoyed locally. There are some superb walks direct from the property and a number of good beaches within easy reach. A boat trip from the harbour to see the local seal population is close to hand and is particularly recommended. Plockton was the setting for the television series Hamish Macbeth, and the early 70's cult film, The Wicker Man. Plockton's close proximity to the Isle of Skye, the wonderful Applecross peninsula and the Torridon mountain range all make it an ideal base for exploring the whole of the Western Highlands. The nearby town of Kyle of Lochalsh is just five miles from Plockton and provides a good shopping centre, as well as an indoor swimming pool. Just a few miles further is Eilean Donan Castle, enchantingly situated on a promontory at the meeting place of three lochs and accessed by a small causeway. Caladh Reidh is within easy walking distance of Plockton’s excellent restaurants, bars, café and small shop, all noted for their fresh Scottish produce. The nearest pub, hotel and post office are all just 300 ydsThe nearest shop and restaurant just 250 yards and the Railway station on the scenic Inverness to Kyle line is on the outskirts of the village, only a mile from Caladh Reidh.